← Living in the Spirit… or not…. Still waiting on that other new book. Fortunately, Keith Meyer (he of Whole Life Transformation) hooked me up with this new one in the meantime, and I’m glad he did. In some ways, it’s similar to the journey Keith took with Church of the Open Door, but frankly it sounds like this particular story has been more radical — or at least more difficult, as its subtitle readily implies. Kent Carlson and Mike Lueken. Renovation of the Church: What Happens When a Seeker Church Discovers Spiritual Formation. Introduction by Dallas Willard. Softcover, 192p., $15.00. IVP Books. The short version: Carlson and Lueken, co-pastors of Oak Hills Church in Folsom, California, share the 25-year history of what started as a seeker-sensitive church; then share in depth about the past 10 years, when leadership as a whole recognized the need for make spiritual formation the church’s central focus; then address the challenges the church faces to this day in getting the congregation on board and growing. • Carlson and Lueken’s desire to change—and their reasons for it—are altogether inspiring. • They’re also refreshingly honest about their mistakes and challenges—some variation on the phrases “we’re still working on it” or “we didn’t have an answer” comes up often. • And they’re a bit frustrating in translating what they’ve learned into terms that could help the rest of us. So let’s give some examples of those latter issues first, then work back up. Later in the book, the authors break down some of the current practices at Oak Hills especially regarding outreach and worship, but most of said practices don’t seem all that unique. Not that it makes them bad, obviously; it just makes it hard to visualize where the major paradigm shift is occurring, and how the clearly personal transformation among Oak Hills’ leadership has been inculcated into the congregation (although the shift in focus on quality of content over style of worship was helpful to point out). Elsewhere, the authors mention a curriculum they use with their congregation… and then move on. I would have really liked to have heard more about that. There also was talk about the use of solitude and silence within the congregation; again, I liked the idea and really would have liked to have seen it fleshed out more here. The one innovation, if you will, that did jump out and seemed immediately applicable was the “One Thing” small groups—a roughly year-long commitment where members are devoted to helping each other address one specific spiritual-formation/character issue in each of their lives. 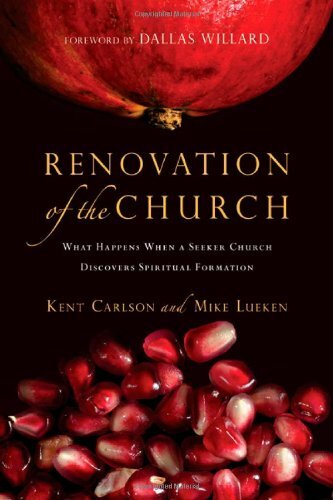 Moving on… I appreciated Lueken’s confession that, as a result of this shift in focus from outward growth to inward transformation, “Evangelism is [now] the weakest part of our [once seeker-friendly] church,” then using that point to emphasize the importance of finding a balance between spiritual formation, mission and evangelism. “Perhaps our greatest lesson from the past decade is that it is spiritually formative to be dissatisfied and unable to resolve that dissatisfaction. In fact, there is hardly a better catalyst for transformation than to not get what we want. Sitting in the dissatisfaction, without frantically trying to resolve it, can do wonders for a human soul. A big way of trusting God that the authors had tackle head-on was their own sense of ambition. Numbers meant accomplishment; sacrificing those numbers also meant relying on God. One practical step Carlson and Lueken took in addressing this issue was to become co-pastors (originally, Carlson was founding and senior pastor; Lueken had come on some time later as spiritual formation pastor after a failed church plant — another hard lesson about ambition). The story of their deepening friendship while working together as equals runs throughout the book. So that’s it, in a nutshell. I leave it for you to discover the rest—not least of all, more thoughts about consumerism and God’s meaning of success. So go do it. This entry was posted in Uncategorized and tagged book review, church renewal, discipleship, kent carlson, mike lueken, spiritual formation. Bookmark the permalink.